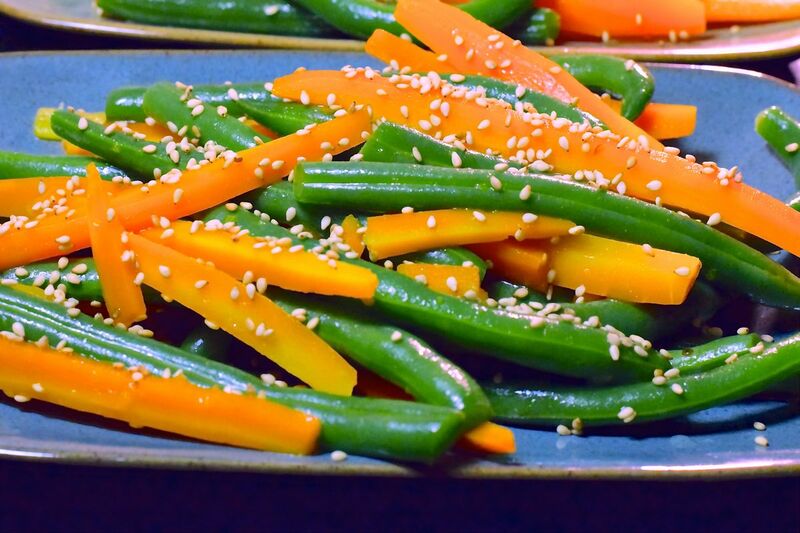 For your summer enjoyment: Chilled, crisp-tender green beans and carrots lightly splashed with a simple tart and sweet dressing, sprinkled with toasted sesame seeds. What do I mean by crisp-tender? When you blanch veggies by briefly cooking them in boiling water, then plunging them into cold water to stop the cooking, they stay brightly colored and become tender while still remaining crisp like a fresh veggie. You can make this simple preparation with all beans or all carrots if you like. Red bell pepper would also be a great addition. This makes a fabulous accompaniment to Asian food or a refreshing mayo-free side dish for your next barbecue. Equipment: Large pot and colander for blanching. Blanch your veggies: Bring a large pot of water to a boil, salted with 1 T. kosher salt.While the water is heating, prepare a large bowl or sink full of cold water (you can add ice cubes to it if you like) - leaving enough head room to add the veggies once they are cooked. Once a rolling boil is achieved, add the carrots and simmer for 5 minutes. Add the green beans and simmer for 5 minutes more. Drain the veggies, rinse with cold water, then immediately plunge them into the cold water bath and let stand while you prepare the dressing and toast the sesame seeds. Prepare the dressing: Mix the seasoned rice vinegar and sesame oil. Done! Toast the sesame seeds: You can toast your sesame seeds in a small non-stick pan over high heat for a few minutes. Here's how not to burn 'em: Pay attention! Shake the pan every 30 seconds or so and do not walk away or get distracted (the voice of experience is speaking here). Turn off the heat as soon as you SMELL toasted sesame even if you don't see browning yet. Leave the sesame seeds in the hot pan to finish browning at low risk of burning. This whole process will take about 2-3 minutes. Assemble your dish: Drain the blanched veggies and pat dry. Toss with the dressing and sprinkle with the sesame seeds. Although it's delicious immediately, this dish gets even better after sitting for a couple of hours while the veggies soak up the dressing, so pop it in the fridge till you're ready to eat it. Enjoy! It’s oh, so yummy with rice and pickles…:) Day in, day out…!